Interested in Bringing Your Sport to the City? Are you looking to drive more buzz and interest for your sport/organization in New York City? Are you looking for a unique idea to help you promote the game of golf? In 2007, UBS took "city golf" to the next level with "The UBS Golf Challenge: Experience THE PLAYERS Championship at Rockefeller". UBS created an interactive exhibit at the Rockefeller Center that featured a scaled replica of THE PLAYERS Stadium Course's iconic island 17th hole. Fans were provided the chance to hit a shot onto an island green surrounded by water ( the shot approximately 50 yards - 1/4th the distance of the actual hole at THE PLAYERS Championship). The exhibit attracted a wide variance of ongoers and participants, including businessmen, locals, and tourists. The USB exhibit also featured a putting area, full-swing net, golf pros on-site, and a giant LED television broadcasting the tournament for consumers to enjoy the ultimate golf experience. 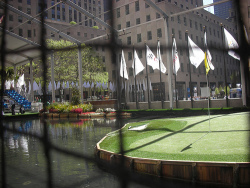 Tishman Speyer partnered with Cutlip Golf Design to recreate the famous 17th hole and transform Rockefeller Plaza into a unique golf experience. The promotional exhibit required 3,500 square feet of sod, 31,000, gallons of water, 40,000 pounds of fill, and a large amount of netting.